There are currently 94,251 users on this website. Mint Marks When Did They Start Being Used In Medieval Europe? I am presenting "ducats to dollars" and the second week of the ANA summer seminar. As I have been going through what I am covering I suddenly realised there was one interesting question I hadn't thought of. In Christian Europe when did mint marks start being used? I had just been going over the evolution of silver coin and got up to the first Real and I realised that the real of Peter I (the cruel) is the first European silver coin I am discussing that has mint marks on it. I am not covering Carolingian coins But I am pretty sure those deniers had the mint written on them rather than bearing a mint mark. I know gold florins ( First struck 1252) had, what I think are better described of as privy marks on them. So when did the first mint marks end up on Christain European Medieval coins( not dark ages coins)? @AK, this is an interesting question. Just to be clear, are you restricting this question to letters only, or marks identifying mints of any type? Also, does the Byzantine Empire count as "Christian European Medieval"? My focus is on the "renaissance" of coin in Europe. From the perspective of my presentation, Byzantium is just the eastern Roman empire. So the short answer is no. When Odoacer deposed the last western Emperor in 476. He handed the imperial insignia of Rome to the eastern emperor and became King of Italy. he did appear to acknowledge that he was "subservient" to the eastern emperor This ment the right to strike the gold Solidus( an imperial coin) was lost to Europe( the Visigoths and some other tribes did ignore this principle). From that time on there was a long economic contraction in the western Empire. Effectively coin production disappeared from western Europe( or course some coin was struck but it was barbaric in every sense). The Carolingians introduced the "new denarius" in the 8th-9th century that ended up being the standard medieval penny when the middle ages started(10th century). As Byzantium faded in power commercial activity returned to Europe starting in places like; Sicily Venice Genoa and Pisa. The 13th century saw the commercial revolution ( started in the 1160s) take off and that's when we see new coin being produced in Europe( the Ducalis, Grosso, florin etc). Frederik II of Sicily produced the Augustalis... arguably the first genuine European gold Solidus since the end of the western empire. I have traced through the main significant coins ( that track the commercial revolution) from Europe(and apart from the Arabic influenced issues the first coin that again seems to bear mint marks is the real... I am sure there must be others....but it is equally possible the Peter I was the first to reintroduce them in Christian mainland Europe. I am assuming we are referring to a type with same design obverse and reverse, and with only a letter or symbol different, and being used to identify the mint? First, I guess this means we are talking about sovereign entities large enough to support multiple mints, which probably rules out large swaths of medieval Europe (all the tiny city-states). Of the countries I am familiar with, I can only find an example from Poland which is close to this. Under the reign of Louis of Hungary (1370-82), Polish denars are minted in Krakow and Poznan. They both have the Polish eagle obverse. The Poznan denar has a large P reverse, but the reverse designs are not identical, which I assume rules this example out. 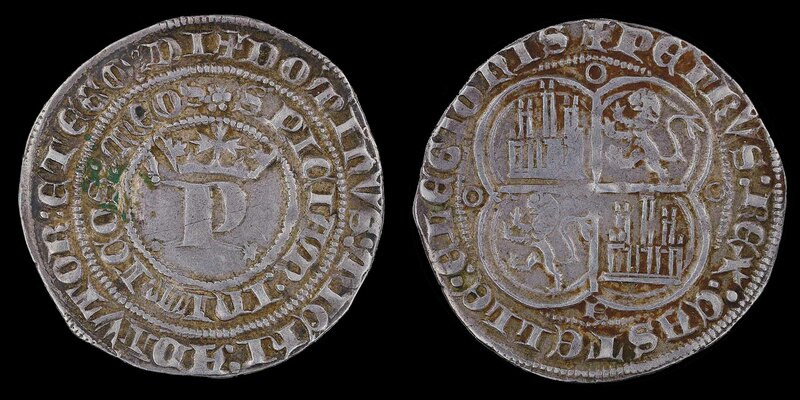 Other than this, I don't think we see the same design differing only by a mint mark until at least the mid-1500s. Much more common is to see a denomination with the same obverse, but with a reverse design which is indicative of the mint (crown for Krakow, double-barred cross for Torun, stacked crosses for Gdansk and ELbing, the latter with a crosshatched background). In Brabant, the Antwerp mint adopted a small hand as its mint mark, but I do not know the date. It is in use by the year 1500, but I'm not sure how much earlier. Certainly the silver coins issued by Jean III (1312-1355) still have the Antwerp city name spelled out. 1c5d knows Brabant coins well, and maybe can comment, if he knows an earlier instance than ca. 1500. I have some of King Charles Robert (1307-42) and King Louis I (1342-82) both of Hungary. In the 1100's there were siglae (combinations of points,lines,wedges,and crosses) that could have been a precursor to mint marks. Mint marks existed before the invasion in Britain, but they might not count for this purpose - the moneyer always put their name on too, and the mark was always a simple abbreviation of the name of the settlement. E.g., for Cnut, the obverse invariably read something along the lines of CNVT REX ANGLORV, while the reverse would have a long cross and read [MONEYER] [MINT], with the mint town always abbreviated so the moneyer could squeeze their whole name in (e.g. LEH (Leicester), LV (London), TOR (Torksey), CR (Cricklade) or sometimes when the moneyers name was very short, more of the town could be included, e.g. MANA MO LINCOL (Lincoln), even though other moneyers were forced to put simply LI). In the time period you are looking at (1200-1400), there are not so many places in Northern Europe large enough to have multiple mints with enough centralized power to standardize design. The obvious are England and Royal France (remember France was much smaller back then, less than half its current size, lacking Alsace, Lorraine, Burgundy, Provence, Aquitaine). Duchy of Brabant has multiple mints, as mentioned, from at least 13th c. Maybe Bohemia and Hungary, too? Finally, I wouldn't be surprised if there is a gray area where we have just the first letter or two of a mint name on a coin too small to have a complete legend. Brabant deniers from the 1282-1294 have a coat of arms obverse, and a cross reverse with either L O V A (Leuven), B R V X (Brussels), or A N T W (Antwerp)in the angles, but no additional legend. DO we call these letters a legend (can a legend be a single word?). Or a mint mark? cheers. To some, it may have seemed a bizarre question but when I had the series of coins in front of me the real with its mint mark seemed so out of place. I hadn't thought of the size of states at that time, now it seems so obvious to me. It also has me thinking about Bohemia. Prior to the mines opening in Kutna Hora, there had been 17 different mints there. Once the mines in Kutna Hora came under Royal control(by 1300)all those mints were moved to Kutna Hora. As far as I know, there are no mint marks on the Prager Groschen( the coin struck at Kutna Hora) however it is more than possible there are mint marks on the coins that preceded it( when the mints were disperesed across the country).